What Do You Get A Knitter Who Is A Cat Lover? This is an easy question for me, being a cat owner and a knitter. I have the perfect solution. It is also something that a non knitter would not know existed. The solution is - A yarn bowl! What is a yarn bowl? This is a yarn bowl. The yarn feeds through a slot eliminating tangles and the cat cannot create merry havoc by chasing the ball of wool around the room. As a knitter I have several WIPs (Works In Progress) and I know some people who like to have a bowl for each project as it keeps everything together and nice and tidy. My cat has reached elderly status but when he was younger he would chase the ball of wool around when I was knitting and I would have to hide the wool. 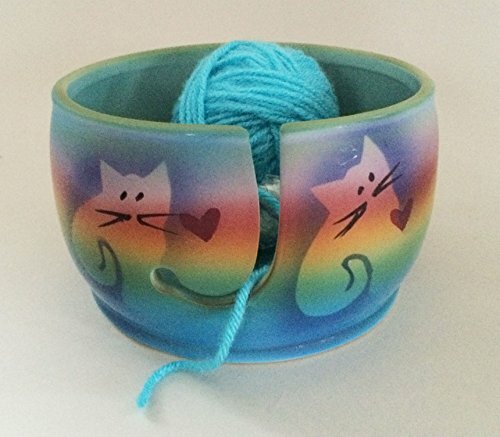 If you are looking for a gift for someone who loves cats and knits a yarn bowl is a beautiful and practical idea. I wish I had had one of these a long time ago. Hang on, maybe they weren’t invented then. Not only can you get some super cool ones but it will be a most wanted and useful gift.There are lots of different types and styles and design and the most expensive isn’t necessarily the best. 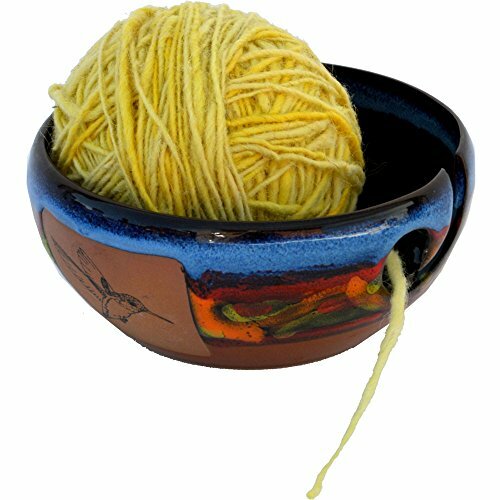 Top Tip - If using the yarn bowl on a slippery surface use a disc of non slip liner. Each of these bowls are signed by the artist, Judith Stiles. The measurements are 6″x6″x3″. Some of the wooden bowls have larger dimensions than this bowl. 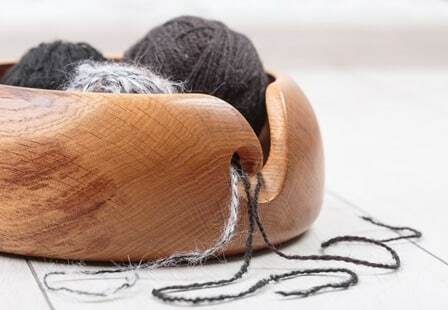 The yarn feeds well in this bowl. The design is inspired by Mog The Cat. This selection of wooden bowls were chosen carefully to represent good quality. It is important that the finish is smooth so that the wood does not snag the wool. Certainly rough edges can be sanded, however as a new purchase this is not desirable, particularly if giving as a gift. All of these bowls are a similar size and hold a skein of wool comfortably. 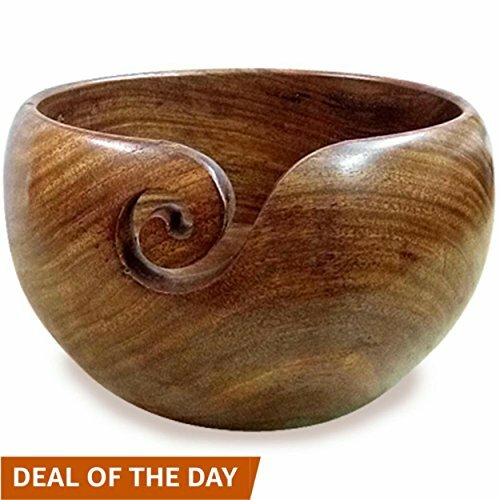 This bowl is made from Rosewood which is a beautiful rich color. It is heavy enough, that the bowl won’t slide around but still light enough to easily carry. It also comes with a travel pouch, so the whole knitting project is portable​. The bowl could sit on the floor of the car when knitting and travelling as a passenger – yes we knitters do that. This bowl is handmade and has no seams or joins. All surfaces are smooth to ensure that wool will not snag. It is made from Indian Sheesham Rosewood. It also comes with a velvet bag which is great if it being given as a gift. 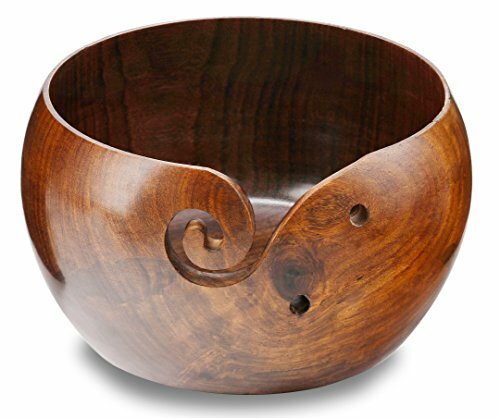 This bowl is made from European Walnut Wood. It measures- 7″ diameter x 3″ height. It will comfortably fit a 3.5oz/100-gram ball of bulky yarn. It comes with a knitting project bag really making it the perfect gift. The project bag is a drawstring bag and is made from cotton muslin. 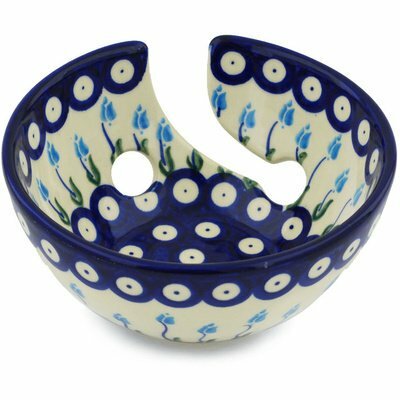 Something to consider with ceramic yarn bowls - Ceramic or pottery yarn bowls are possibly going to be heavier than other yarn bowls. This is actually okay, as it means that these bowls will have stability and won't move about when the yarn is being used and drawn through the slot. 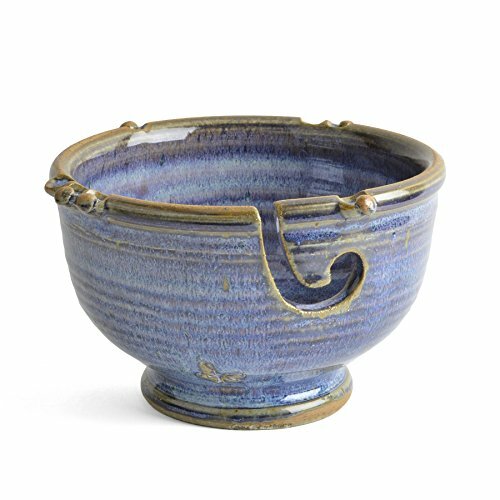 This is a beautiful bowl and almost looks as though it has been extracted from some ancient ruins, but it is hand made in the USA. There are different colours which actually give each bowl a unique look. As each bowl is created by hand, there will be variations. 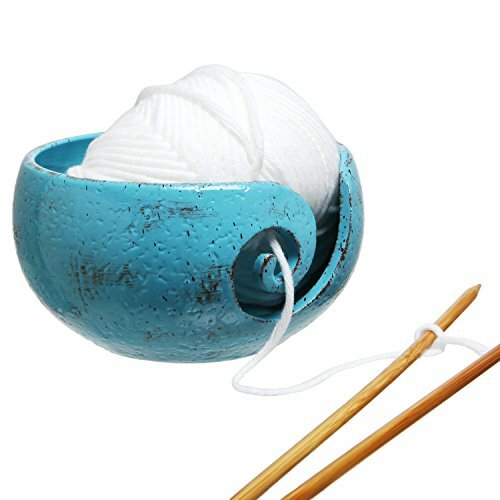 Knitting Yarn Bowl, Yarn Bowl for Crochet, Best Gift for Knitters, Bright colors choose from Red, Orange, Green, Yellow or Blue inside. Each piece is handmade in South Carolina by Barbara and shipped USPS Priority Mail with insurance. That’s actually great for peace of mind. These bowls are made by the same artist and in the same studio in Charleston, South Carolina, as the bowls above. The difference is, these bowls are slightly smaller which is reflected in the price. The color option are different also as there is a bright cobalt blue and beautiful dark sea green both with a very glossy glaze. Once again, Barbara is the artist. I think it is safe to say that Barbara is an expert yarn bowl artist. I love the Game of Thrones reference. 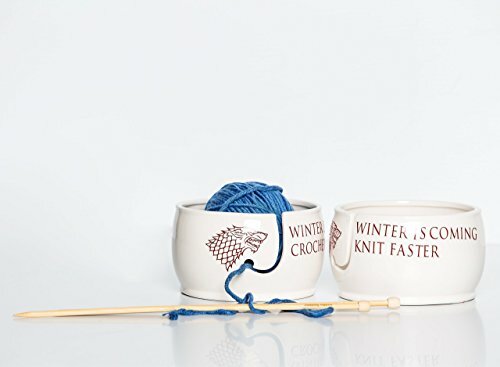 Choose from one of two quotes – Winter Is Coming Knit Faster or Winter Is Coming Crochet Faster. I love this Polish pottery and it is even nicer when you see it in real life. It feels good quality and it looks good quality and the traditional design fits any decor. It’s a beautiful piece, hand crafted and made in Poland. This bowl has a distressed appearance and comes in three different colors, the color shown and also caramel and off white. This is just one of 20 bowls available. This is a popular design. The bowls are made in Colorado. I like the shape and the height to diameter ratio of this bowl. It measures approximately 5″ (inside diameter) by 4 inches high. 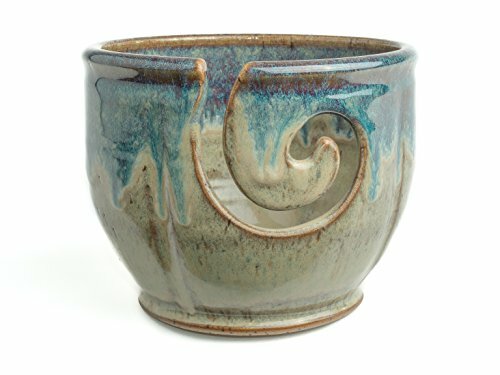 There are other colors available from Midnight Sun Pottery which is located in North Carolina. 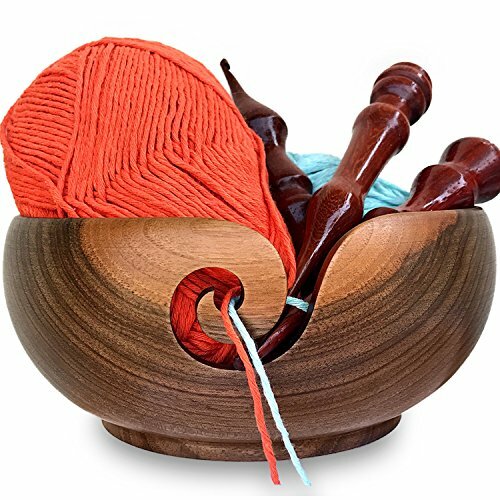 This yarn bowl is different because it is made from plastic and has a detachable rubber ring that fits around the base to stop it from slipping when on smooth surfaces. Being lightweight it is the ultimate in portable yarn bowls and can be transported anywhere. It works best if the yarn is pulled from the center of the ball and actually all yarn bowls will work better this way. It's not essential but pulling yarn from the centre does mean that the ball of yarn is not jumping around as it unravels whilst knitting. Did you get all that? You will know what I mean, if you are a knitter. 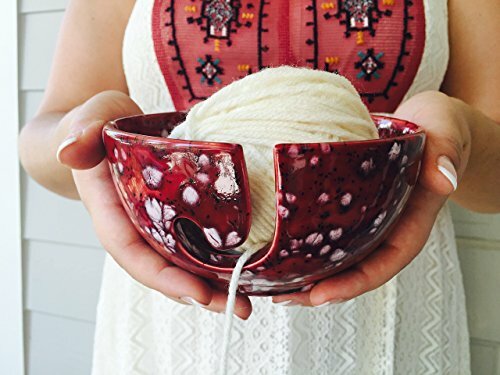 By the way, these bowls are just as handy for crocheters as knitters. 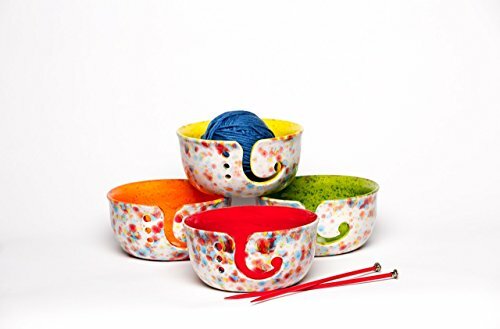 I can guarantee that any knitter would love one of these bowls. Most knitters have more than one project happening at a time, even if they don’t admit that fact, so it isn't beyond the realms of possibility to have more than one yarn bowl. 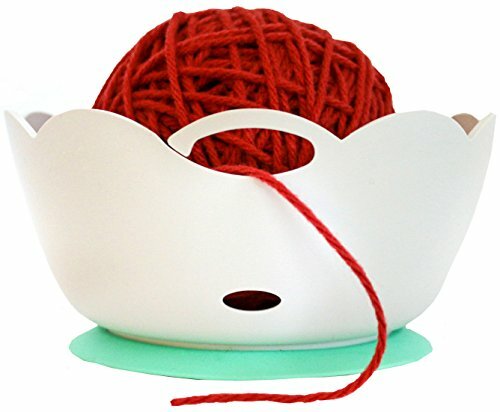 A cat yarn bowl is going on my Christmas list this year. There are more cat related gifts here.